Can never make a Brother. ed. by Carl Glick. Thomas Crowell Co., N.Y.: 1953. p. 164. The same poem as above, but a longer version. The last line, second verse, was "...quench the..." instead of "...quest for...", but that sounded too much like a typo. We would not be derided. O'er them we shall prevail. That should adventure, bold essay! To quest for glorious sun! This is condensed from a slightly longer bio on Bro. Bulwer-Lytton at the British Columbia & Yukon website. Yes, this was the writer of "It was a dark and stormy night." Edward was a prolific Victorian novelist, editor of the New Monthly Magazine, member of Parliament and Secretary of State for the Colonies. 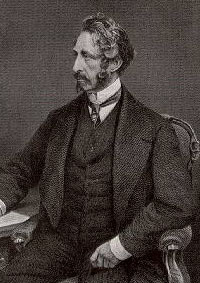 Besides "It was a dark and stormy night...", the opening line to his 1830 novel Paul Clifford, he also coined such expressions as "the great unwashed" and the phrase "the pen is mightier than the sword."